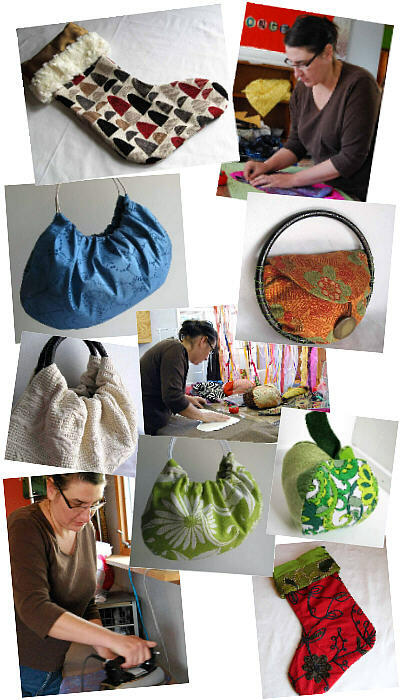 In the land of misfit fabric, you will find a selection of handmade objects from original designs. I love mid-century modern and everything with a 70's vibe. The designs are not earthshakingly new, but rather twists on the traditional reinterpreted with unexpected materials and shapes. Inspiration comes from all over my house and yard. Many of the purse patterns are based on the dishes in the cupboard. Although most supplies are new (will be mentioned in the descriptions when they are not), they are often the disassociated; discontinued upholstery samples, scraps from alternations, end bolts, remnants, and yard sale finds. Spongetta is about looking at the world just a little bit differently. My goal is to meld the elegant with whimsy. Sometimes we use traditional techniques with a nontraditional fabric. Other times, it is the color that is a surprise. My favorite thing to do is create a patchwork from rich fabrics such as velvets and silks, but then relaxing them a bit with cottons, burlaps and denims. Classic patterns such as paisley, fleur de lis, Jacobean, and houndstooth embrace a kitschy feel that is both retro and modern. This is the place where misfit fabric finds a home.